(Nanowerk News) Semiconductor nanocrystals (NCs) emit light at wavelengths that can be tuned by particle size and composition, and are more stable to light than organic dyes, so hopes for their applied use are high. When coated with such agents as surfactants and a semiconductor with a wide band gap, these NCs show strong photoluminescence (PL), cadmium selenide (CdSe) and cadmium telluride (CdTe) being representative examples. Water dispersible NCs are well-suited to biotechnology applications, and furthermore are amenable to sol-gel processing, making it possible to produce highly photoluminescent glass beads incorporating multiple NCs. In recent years, NCs have been sought that do not contain toxic cadmium, and we have succeeded in developing blue light emitting zinc selenide (ZnSe) family NCs followed by red~green light emitting indium phosphide (InP) family NCs. Initially, InP cores (particle diameter ~3 nm) are produced in an organic solution via a safe, inexpensive method, and we found a method to transfer these to an aqueous phase. Zinc sulfide (ZnS) shells were formed in a subsequent photochemical reaction using ultraviolet (UV) irradiation, and we produced water dispersible InP/ZnS core-shell type NCs exhibiting high PL efficiency in water. Here the ZnS shell is formed by decomposition of a sulfur-containing surfactant, whereupon the generated S2- reacts with Zn2+ in the aqueous solution. 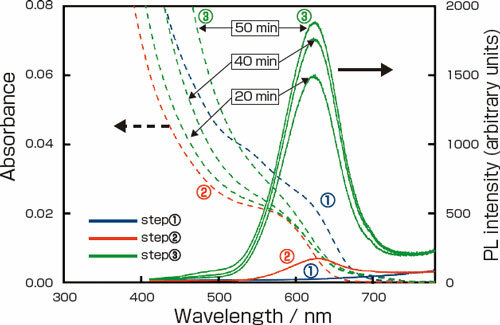 Previously, using thioglycolic acid (TGA) we obtained water-dispersible InP/ZnS NCs with a high PL efficiency (68 %) in water ("Highly Luminescent Water-Soluble InP/ZnS Nanocrystals Prepared via Reactive Phase Transfer and Photochemical Processing"). This time, using low-toxicity thioglycol (TG) we produced similar water-dispersible InP/ZnS NCs by the procedure below. The InP NCs are dispersed in organic solvent, then brought into contact with an aqueous solution containing Zn2+ and TG. A surface reaction takes place with the NCs transferring into the aqueous phase. At this time, the NC surface dissolves, their light absorbance decreases, and simultaneously a thin ZnS shell is formed with weak PL appearing. ((1) -> (2) in the figure). Next the NC suspension is irradiated with UV light, and the ZnS shells grow. Due to the electron confinement effect brought about by their thick shells (~1.5 nm), PL intensity of the InP/ZnS NCs increases ((2) -> (3) in the figure), and a high PL efficiency (43 %) was obtained. Compared to using TGA, small scattering in longer wavelength region ((3) in the figure) indicates that using TG, which lacks a charge, made the TG-coated NCs agglomerate somewhat easily than the TGA-coated NCs. As described above, we prepared water-dispersible, photoluminescent InP/ZnS NCs using phase transfer and irradiation with light. The fact that we were able to use sulfur-containing surfactants with different functional groups suggests the possibility of producing NCs coated with a wide variety of molecules. We plan to expand the range of fluorescent reagents this technology can provide.